Congratulations to the 4th grade RAIDER PRIME CONTROL FREAKS FIRST LEGO League robotics team. The team competed in Allen, TX on December 2. There were 34 teams at the competition and their overall robot match score put them 14th out of 34. 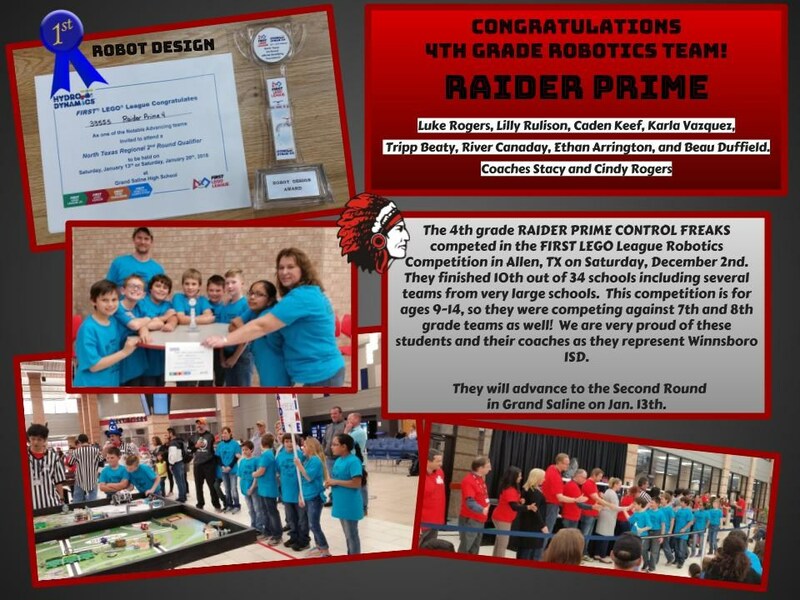 Their project interview score, core values interview score, robot design interview score and robot match score landed them in the top 10 out of 34 schools including several teams from very large schools. This competition is for ages 9-14 so they were competing against 7th and 8th grade teams as well! The team was coached by Stacy Rogers in programming and design and Cindy Rogers in core values, project design and interview skills. They will be competing again in Grand Saline on Jan. 13th. The team members are Luke Rogers, Lilly Rulison, Caden Keef, Karla Vazquez, Tripp Beaty, River Canaday, Ethan Arrington, and Beau Duffield.